The 2001 World Series, the 97th edition of Major League Baseball's championship series, took place between the Arizona Diamondbacks of the National League and the three-time defending champions New York Yankees of the American League. The Diamondbacks won the best-of-seven series four games to three. Considered one of the greatest World Series of all time, memorable aspects included two extra-inning games and three late-inning comebacks. It ended on a Game 7 walk-off hit in the form of a bases-loaded blooper single off the bat of Luis Gonzalez. This was the third World Series to end in this way, following 1997 and 1991. This was also the Yankees' fourth consecutive World Series appearance, after winning it in 1998, 1999, and 2000 (the previous year). This was the first World Series ever played in the state of Arizona and the Mountain Time Zone. With the All-Star Game format change in 2003, the World Series would not open in the city of the National League champion again until 2010. This was the last World Series not to feature a wild card team until 2008. This was also the first World Series to end in November, due to the delay in the regular season after the September 11 attacks. With the win by the Diamondbacks, the franchise became the first World Series champions from a Far West state other than California and the first major professional sports team from the state of Arizona to win a title. Randy Johnson and Curt Schilling were named the series co-MVPs. The Arizona Diamondbacks reached the Series in just their fourth season, breaking a record previously held by the Florida Marlins, and took on the three-time defending champion New York Yankees, who had won the World Series in four of the last five years and tried to become the first team to win four straight titles since the Yankees' five consecutive titles from 1949 to 1953. Arizona captured the best of seven games Series, four games to three, thereby dethroning the defending World Champions and earning their first title. Arizona won the first two games at home handily, but New York won the next three in close contests at the Yankee Stadium, including two dramatic ninth-inning comebacks against Arizona closer Byung-Hyun Kim. Arizona won the sixth game handily with Randy Johnson pitching a masterful game. Johnson also pitched in relief of Curt Schilling in Game 7. The Diamondbacks won that game by the score of 3–2, ending when Jay Bell scored the winning run on a bloop single by Luis Gonzalez, in the bottom of the ninth inning off the Yankees' ace closer, Mariano Rivera. Johnson, credited with the Game 7 win, became the first pitcher to win three games in the same World Series since Detroit Tigers' Mickey Lolich in 1968. The home team won every game in the Series, and as of 2016 is the most recent time this has happened. This had only happened twice before, in 1987 and 1991 also in domed ballparks; in the two earlier championships, the Minnesota Twins won the Series. This Series was the subject of an HBO documentary Nine Innings from Ground Zero in 2004. Though the series was played to the maximum seven games, the Diamondbacks outscored the Yankees 37–14 as a result of large margins of victory achieved by Arizona in Bank One Ballpark relative to the one run margins the Yankees achieved at Yankee Stadium. Arizona held powerhouse New York to an .183 batting average, the lowest ever in a seven-game World Series. The previous record was .185 by the St. Louis Cardinals in the 1985 World Series when they lost to the Kansas City Royals. Due to the postponement of MLB games as a result of the September 11 attacks, the World Series began Saturday, October 27, 2001, the latest start date ever for a World Series until the 2009 World Series, which started on October 28. The last three games were the first major-league games (other than exhibitions) played in the month of November. This was just the fourth time that no World Series champion was decided within the traditional month of October. The previous three occurrences were in 1904 (no series), 1918 (series held in September due to World War I), and 1994 (no series due to work stoppage). Additionally, the Series took place in New York City only seven weeks after the attacks, representing a remarkable boost in morale for the fatigued city. The Yankees struck first in Game 1 when Derek Jeter was hit by a pitch with one out in the first and scored on Bernie Williams's double two batters later. However, Arizona's Curt Schilling and two relievers held the Yankees scoreless afterward. They managed to get only two walks and two hits for the rest of the game, Scott Brosius's double in the second and Jorge Posada's single in the fourth, both with two outs. Meanwhile, the Diamondbacks tied the game on Craig Counsell's one-out home run in the first off of Mike Mussina. After a scoreless second, Mussina led off the third by hitting Tony Womack with a pitch. He moved to second on Counsell's sacrifice bunt before Luis Gonzalez's home run put the Diamondbacks up 3-1. A single and right fielder David Justice's error put runners on second and third before Matt Williams's sacrifice fly put Arizona up 4-1. After Mark Grace was intentionally walked, Damian Miller's RBI double gave Arizona a 5-1 lead. Next inning, Gonzalez hit a two-out double off of Randy Choate. Reggie Sanders was intentionally walked before Gonzalez scored on Steve Finley's single. An error by third baseman Brosius's scored Sanders, put Finley at third, and Williams at second. Both men scored on Mark Grace's double, putting Arizona up 9-1. Though the Diamondbacks got just one more hit for the rest of the game off of Sterling Hitchcock and Mike Stanton (Williams's leadoff single in the seventh), they went up 1-0 in the series. Arizona continued to take control of the Series with the strong pitching performance of Randy Johnson. The Big Unit pitched a complete game shutout, allowing only four baserunners and three hits while striking out eleven Yankees. Andy Pettitte meanwhile nearly matched him, retiring Arizona in order in five of the seven innings he pitched. In the second, he allowed a leadoff single to Reggie Sanders, who scored on Danny Bautista's double. Bautista was the only Arizona runner stranded for the entire game. In the seventh, Pettitte hit Luis Gonzalez with a pitch before Sanders grounded into a forceout. After Bautista singled, Matt Williams's three-run home run put Arizona up 4-0. They won the game with that score and led the series two games to none as it moved to New York City. 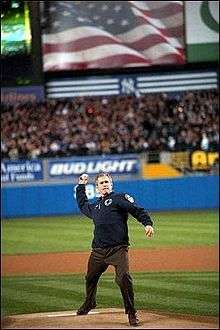 Donning an FDNY fleece, with a bulletproof vest underneath, President Bush tosses out the ceremonial first pitch. The game was opened in New York by United States President George W. Bush, who threw the ceremonial first pitch, a strike to Yankees backup catcher Todd Greene. Bush became the first sitting US President to throw a World Series first pitch since Dwight D. Eisenhower in 1956. He also threw the baseball from the mound where the pitcher would be set (unlike most ceremonial first pitches which are from in front of the mound) and threw it for a strike. Chants of "U-S-A, U-S-A" rang throughout Yankee Stadium. Yankees starter Roger Clemens allowed only three hits and struck out nine in seven innings of work. Yankees closer Mariano Rivera pitched two innings for the save. Jorge Posada's leadoff home run off of Brian Anderson in the second put the Yankees up 1-0. The Diamondbacks loaded the bases in the fourth on two walks and one hit before Matt Williams's sacrifice fly tied the game. Bernie Williams hit a leadoff single in the sixth and moved to second on a wild pitch one out later before Posada walked. Mike Morgan relieved Anderson and struck out David Justice before Scott Brosius broke the tie with an RBI single. The Yankees cut Arizona's series lead to 2-1 with the win. Game 4 saw the Yankees send Orlando Hernandez to the mound while the Diamondbacks elected to bring back Curt Schilling on three days' rest. Both pitchers gave up solo home runs, with Schilling doing so to Shane Spencer in the third inning and Hernandez doing so to Mark Grace in the fourth. Hernandez pitched 6 1⁄3 solid innings, giving up four hits while Schilling went seven innings and gave up three. With the game still tied entering the eighth, Arizona struck. After Mike Stanton recorded the first out of the inning, Luis Gonzalez singled and Erubiel Durazo hit a double to bring him in. Matt Williams followed by grounding into a fielder's choice off of Ramiro Mendoza, which scored pinch runner Midre Cummings and gave the team a 3-1 lead. With his team on the verge of taking a commanding 3-1 series lead, Diamondbacks manager Bob Brenly elected to bring in closer Byung-Hyun Kim in the bottom of the eighth for a two-inning save. Kim, at 22, became the first Korean-born player ever to play in the MLB World Series. Kim struck out the side in the eighth, but ran into trouble in the ninth. Derek Jeter led off by trying to bunt for a hit but was thrown out by Williams. Paul O'Neill then lined a single in front of Gonzalez. After Bernie Williams struck out, Kim seemed to be out of trouble with Tino Martinez coming to the plate. However, Martinez drove the first pitch he saw from Kim into the right-center field bleachers, tying the score at 3-3. The Yankees were not done, as Jorge Posada walked and David Justice moved him into scoring position with a single. Kim struck Spencer out to end the threat. When the scoreboard clock in Yankee Stadium passed midnight, World Series play in November began, with the message on the scoreboard "Welcome to November Baseball". Mariano Rivera took the hill for the Yankees in the tenth and retired the Diamondbacks in order. Kim went out for a third inning of work and retired Scott Brosius and Alfonso Soriano, but Jeter hit an opposite field walk-off home run on a 3–2 pitch count from Kim. This walk-off home run gave the Yankees a 4–3 victory and tied the Series at two games apiece, making Jeter the first player to hit a November home run and earning him the tongue-in-cheek nickname of "Mr. November". Game 5 saw the Yankees return to Mike Mussina for the start while the Diamondbacks sent Miguel Batista, who had not pitched in twelve days, to the mound. Batista pitched a strong 7 2⁄3 scoreless innings, striking out six. Mussina bounced back from his poor Game 1 start, recording ten strikeouts, but allowed solo home runs to Steve Finley and Rod Barajas in the fifth. With the Diamondbacks leading 2–0 in the ninth, Byung-Hyun Kim was called upon for the save despite having thrown three innings the night before. Jorge Posada doubled to open the inning, but Kim got Shane Spencer to ground out and then struck out Chuck Knoblauch. Unfortunately, as had happened the previous night, Kim could not hold the lead as Scott Brosius hit a 1–0 pitch over the left field wall, the second straight game tying home run in the bottom of the ninth for the Yankees. Kim was pulled from the game in favor of Mike Morgan who recorded the final out. Morgan retired the Yankees in order in the tenth and eleventh innings, while the Diamondbacks got to Mariano Rivera in the eleventh. Danny Bautista and Erubiel Durazo opened the inning with hits and Matt Williams advanced them into scoring position with a sacrifice bunt. Rivera then intentionally walked Steve Finley to load the bases, then got Reggie Sanders to line out and Mark Grace grounded out to end the inning. Arizona went to Albie Lopez in the twelfth, and in his first at bat he gave up a single to Knoblauch. Brosius moved him over with a bunt, and then Alfonso Soriano ended the game with an RBI single to give the Yankees a 3-2 victory and a 3-2 lead in the series. With Arizona in a must-win situation, Johnson pitched seven innings and struck out seven, giving up just two runs. The Diamondbacks struck first when Tony Womack hit a leadoff double off of Andy Pettitte and scored on Danny Bautista's single in the first. Next inning, Womack's bases-loaded single scored two and Bautista's single scored another. The Yankees loaded the bases in the third on a single and two walks, but Johnson struck out Jorge Posada to end the inning. The Diamondbacks broke the game open in the bottom half. Pettitte allowed a leadoff walk to Greg Colbrunn and subsequent double to Matt Williams before being relieved by Jay Witasick, who allowed four straight singles to Reggie Sanders, Jay Bell, Damian Miller, and Johnson that scored three runs. After Womack struck out, Bautista's single scored two more runs and Luis Gonzalez's double scored another Bautista being thrown out at home. Colbrunn's single and Williams's double scored a run each before Sanders struck out to end the inning. In the fourth, Bell reached first on a strike three wild pitch before scoring on Miller's double. Johnson struck out before Womack singled to knock Witasick out of the game. With Randy Choate pitching, Yankees second baseman Alfonso Soriano's error on Bautista's ground ball allowed Miller to score and put runners on first and second before Gonzalez's single scored the Diamondbacks' final run. Choate and Mike Stanton kept them scoreless for the rest of the game. Pettitte was charged with six runs in two innings while Witasick was charged with nine runs in 1 1/3 innings. The Yankees scored their only runs in the sixth on back-to-back one-out singles by Shane Spencer and Luis Sojo with runners on second and third. The Diamondbacks hit six doubles and Danny Bautista batted 3-for-4 with five RBIs. The team set a World Series record with 22 hits and defeated the New York Yankees in its most lopsided postseason loss in 293 postseason games. The 15–2 win evened the series at three games apiece and set up a Game 7 for the ages between Roger Clemens and Curt Schilling, again pitching on three days' rest. It was a matchup of two twenty-game winners in the Series finale that would crown a new champion. Roger Clemens at 39 years old became the oldest Game 7 starter ever. Curt Schilling had already started two games of the Series and pitched his 300th inning of the season on just three days' rest. The two aces matched each other inning by inning and after seven full innings, the game was tied at 1–1. The Diamondbacks scored first in the sixth inning with a Steve Finley single and a Danny Bautista double (Bautista would be called out at third base). The Yankees responded with an RBI single from Tino Martinez, which drove in Derek Jeter. Brenly stayed with Schilling into the eighth, and the move backfired as Alfonso Soriano hit a solo home run on an 0–2 pitch. After Schilling struck out Scott Brosius, he gave up a single to David Justice, and he left the game trailing 2–1. Brenly brought in Miguel Batista to get out Derek Jeter and then in an unconventional move, brought in the previous night's starter Randy Johnson, who had thrown 104 pitches, in relief to keep it a one-run game. It proved to be a smart move, as Johnson retired pinch hitter Chuck Knoblauch (who batted for the left handed Paul O'Neill) on fly out to Danny Bautista in right field, then Johnson returned to the mound for the top of the ninth where he got Bernie Williams to fly out to Steve Finley in center field, Tino Martinez to ground out to Tony Womack at shortstop and he then struck out catcher Jorge Posada to send the game to the bottom of the ninth inning. With the Yankees ahead 2–1 in the bottom of the eighth, manager Joe Torre turned the game over to his ace closer Mariano Rivera for a two-inning save. Rivera struck out the side in the eighth, including Arizona's Luis Gonzalez, Matt Williams, and Danny Bautista, which lowered his ERA in the postseason to a major league-best of 0.70 . Although he was effective in the eighth, this game would end in the third ninth-inning comeback of the Series. Mark Grace led off the inning with a single to center on a 1–0 pitch. Rivera's errant throw to second base on a bunt attempt by Damian Miller on an 0–1 pitch put runners on first and second. Derek Jeter tried to reach for the ball, but got tangled in the legs of pinch-runner David Dellucci, who was sliding in an attempt to break up the double play. Rivera appeared to regain control when he fielded Jay Bell's bunt and threw out Dellucci at third base, but third baseman Scott Brosius decided to hold onto the baseball instead of throwing to first to complete the double play. Midre Cummings was sent in to pinch-run for Damian Miller. With Cummings at second and Bell at first, the next batter, Tony Womack, hit a double down the right-field line on a 2–2 pitch that tied the game and earned Rivera a blown save. Bell advanced to third and the Yankees pulled the infield and outfield in as the potential winning run stood at third with fewer than two outs. After Rivera hit Craig Counsell with an 0–1 pitch, the bases were loaded. On an 0–1 pitch, Luis Gonzalez lofted a soft single over the drawn-in Derek Jeter that barely reached the outfield grass, plating Jay Bell with the winning run. This ended New York's bid for a fourth consecutive title and brought Arizona its first championship within its fourth year of existence, making the Diamondbacks the fastest expansion team to win a World Series, as well as the first major professional sports championship for the state of Arizona. In 2009, Game 7 was chosen by Sports Illustrated as the Best Postseason Game of the Decade (2000–2009). For the second consecutive year, Fox carried the World Series over its network with its top broadcast team, Joe Buck and Tim McCarver (himself a Yankees broadcaster). This was the first year of Fox's exclusive rights to the World Series (in the previous contract, Fox only broadcast the World Series in even numbered years while NBC broadcast it in odd numbered years), which it has held ever since (this particular contract also had given Fox exclusive rights to the entire baseball postseason, which aired over its family of networks; the contract was modified following Disney's purchase of Fox Family Channel shortly after the World Series ended, as ESPN regained their postseason rights following a year of postseason games on ABC Family, Fox Family's successor). ESPN Radio provided national radio coverage for the fourth consecutive year, with Jon Miller and Joe Morgan calling the action. Locally, the Series was broadcast by KTAR-AM in Phoenix with Thom Brennaman, Greg Schulte, Rod Allen and Jim Traber, and by WABC-AM in New York City with John Sterling and Michael Kay. This would be Sterling and Kay's last World Series working together, and Game 7 would be the last Yankee broadcast on WABC. Kay moved to television and the new YES Network the following season and WCBS picked up radio rights to the Yankees. It was Kay who announced Derek Jeter's game-winning home run in Game 4 of the series and subsequently anointed him as "Mr. November". After the Yankees lost the World Series, several players moved onto other teams or retired, the most notable changes being the signing of Jason Giambi to replace Martinez, and the retirements of Brosius and O'Neill. Martinez would later finish his career with the Yankees in 2005 after spending the previous three years in St. Louis and Tampa Bay. The Yankees would lose the 2003 World Series to the Florida Marlins and wouldn't win another World Series until 2009, when they defeated the defending champions, the Philadelphia Phillies, in six games. After winning the NL West again in 2002 the Diamondbacks were swept 3–0 by St. Louis in the NLDS. From here they declined, losing 111 games in 2004 as Bob Brenly was fired during that season. Arizona would not win another NL West title until 2007. Schilling was traded to the Boston Red Sox after the 2003 season and in 2004 helped lead them to their first world championship since 1918. He helped them win another championship in 2007 and retired after four years with Boston, missing the entire 2008 season with a shoulder injury. Johnson was traded to the Yankees after the 2004 season, a season that saw him throw a perfect game against the Atlanta Braves, though he would be traded back to the Diamondbacks two years later and finish his career with the San Francisco Giants in 2009. None of the Diamondbacks players from 2001 are active, with Lyle Overbay retiring following the 2014 season with the Milwaukee Brewers. With the retirements of both Derek Jeter and Alfonso Soriano after the 2014 season, Randy Choate is now the last remaining member of the 2001 AL Champion Yankees still active in the majors. Choate is currently a free agent. From 2004 through 2007, the Yankees' misfortune in the postseason continued, with the team losing the ALCS to the Boston Red Sox (in the process becoming the first ever team in postseason history to blow a 3-0 series lead) in 2004, the ALDS to Anaheim in 2005, the ALDS to Detroit in 2006, and the ALDS to Cleveland in 2007. Joe Torre's contract was allowed to expire and he was replaced by Joe Girardi in 2008, a season in which the Yankees would miss the playoffs for the first time since 1993. Buster Olney, who covered the Yankees for the New York Times before joining ESPN, would write a book titled The Last Night of the Yankee Dynasty. The book is a play by play account of Game 7 in addition to stories about key players, executives, and moments from the 1996–2001 dynasty. In a 2005 reprinting, Olney included a new epilogue covering the aftermath of the 2001 World Series up to the Boston Red Sox epic comeback from down 3–0 in the 2004 ALCS. As of 2016, this is the state of Arizona's only world championship among the four major professional sports. The NFL's Arizona Cardinals came close, but lost to the Pittsburgh Steelers in Super Bowl XLIII. The Phoenix Suns have been to two NBA Finals, and lost both times, to the Boston Celtics in 1976, and again to the Chicago Bulls in 1993. The Arizona Coyotes have never advanced to the Stanley Cup Final. On October 11, 2005, A&E Home Video released the New York Yankees Fall Classic Collectors Edition (1996–2001) DVD set. Game 4 of the 2001 World Series is included in the set. On April 29, 2008, The Arizona Diamondbacks 2001 World Series DVD set was released. All seven games are included on this set. ↑ "2001 World Series". Baseball-Reference. Retrieved January 6, 2014. ↑ Fagan, Ryan. "World Series: Ranking the 10 best Fall Classics of all time". The Sporting News. Sporting News. Retrieved 29 October 2014. ↑ "2001 World Series Game 1 – New York Yankees vs. Arizona Diamondbacks". Retrosheet. Retrieved September 13, 2009. ↑ "2001 World Series Game 2 – New York Yankees vs. Arizona Diamondbacks". Retrosheet. Retrieved September 13, 2009. ↑ "2001 World Series Game 3 – Arizona Diamondbacks vs. New York Yankees". Retrosheet. Retrieved September 13, 2009. ↑ "2001 World Series Game 4 – Arizona Diamondbacks vs. New York Yankees". Retrosheet. Retrieved September 13, 2009. ↑ "2001 World Series Game 5 – Arizona Diamondbacks vs. New York Yankees". Retrosheet. Retrieved September 13, 2009. ↑ "2001 World Series Game 6 – New York Yankees vs. Arizona Diamondbacks". Retrosheet. Retrieved September 13, 2009. ↑ "2001 World Series Game 7 – New York Yankees vs. Arizona Diamondbacks". Retrosheet. Retrieved September 13, 2009. Forman, Sean L. "2001 World Series". Baseball-Reference.com – Major League Statistics and Information. Archived from the original on December 3, 2007. Retrieved December 9, 2007. 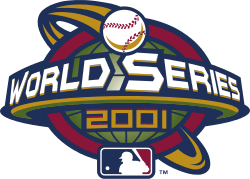 History of the World Series - 2001 at The SportingNews. Archived from the original on 2008. Book on 2001 WS is "the last word on the inside game of baseball"